This was my first interview shoot for Metropolitan Magazine. 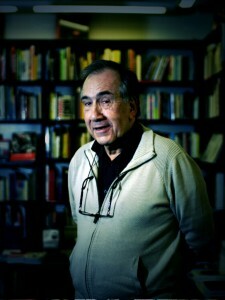 He is a famous poet here who writes in both Spanish and Catalan. I was with the designer at a book reading he was giving at a book store. The problems we had were time and a shop manager who had not been informed we were taking photos; he got a little ‘antsy’. Luckily Mr Margarit was cooperative and I love the twinkle in his eye in this shot. Having David (the designer) there was a boon, as he was holding the strobe camera left in a position that was awkward and humans are so much more flexible than light stands and more agile, they also can be left to deal with stroppy shop managers whilst you just plead ignorance and pack your equipment and leave!